Downloading and CD-burning programs usually provide the option of automatically shutting down the PC on completion of their tasks. However, this energy-saving feature is of little beneﬁt if even after the PC has been switched off, all of the peripheral equipment remains connected to the mains and happily consumes watt-hours. The circuit shown here provides a solution to this dilemma. It is connected ahead of the power strip and connects or disconnects mains power for all of the equipment via a power relay. A connection to a 12-V PC fan (which may be the processor fan or the fan for the chipset, if the latter is present) indicates whether the PC is switched on. If you are certain that the 12-V power supply voltage is switched off when the PC is in the sleep mode, you can use this connection instead. To switch everything on, press the Start button to cause the power relay to be energized and provide mains voltage to all of the equipment. If the PC has an ATX board, its Power switch must be pressed at the same time to cause the PC to start up. When the PC fan starts to run, low-power relay Re1 engages and takes over the function of the Start switch, which can then be released. This state is stable. If the PC switches to the sleep state, the 12-V voltage drops out. The electrolytic capacitor ensures that Re1 remains engaged for a short time, after which it drops out, followed by the power relay. D1 prevents the electrolytic capacitor from discharging through the connected fan, and D2 is the usual freewheeling diode. The system is disconnected from both mains leads and is thus completely de-energized. Be sure to select components that are suitable for their tasks. Naturally, the contacts of Re2 should be rated to handle the total current drawn by all of the peripheral equipment and the PC, and the relay coil must be suitable for use with mains voltage (6 mm minimum separation between coil and contacts). A low-power 12-V relay that can switch mains voltage is adequate for Re2. The Start pushbutton switch is connected to the mains voltage, so a 230-V type must be used. 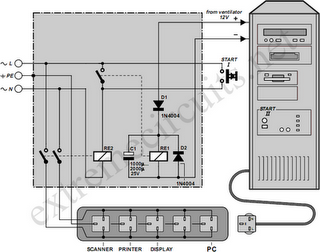 The circuit board layout and enclosure must also be designed in accordance with safety regulations. A separation of at least 6 mm must be maintained between all components carrying mains voltage and the low-voltage components, and the enclosure must be completely free of risk of electrical shock. With a bit of skill, the circuit can be ﬁtted into a power bar with a built-in switch, if the switch is replaced by a pushbutton switch having the same mounting dimensions. 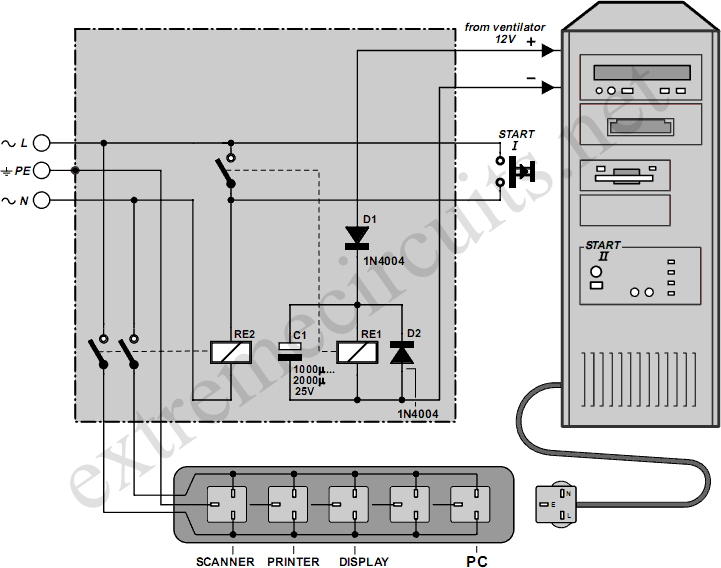 The circuit is not suitable for use with deskjet printers that can only be switched on and off by a front panel button.